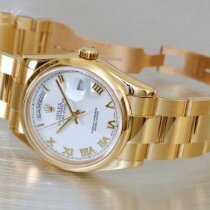 For more information on our watches plus latest prices and our full stock please visit our site. 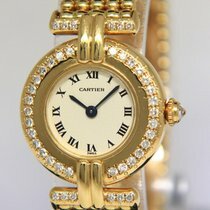 A beautiful example of the classic Cartier Vendome 18k Gold Ladies Vintage Watch. With its attractive double bezelled 33mm case and timeless white dial with roman numerals and blued steel sword hands, the Cartier Vendome exudes the elegance the Cartier brand has become famous for. Enclosed behind its snap back case is the 17 jewel ETA 2512-1 manual wind movement, recently back from a full service by our watchmaker. 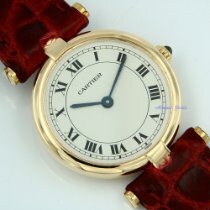 This example is also fitted to a black leather Must de Cartier strap and Cartier buckle both in good condition.